Wood furnishings free Wi-Fi and an indoor pool are within a easy drive from Flathead Lake at the Aero Inn. All 62 rooms come with free Wi-Fi satellite TVs and work desks. Enjoy the complimentary breakfast each morning. Swim in the indoor pool or relax after a day on the slopes in the inn's hot tub and sauna. If you need some entertainment stop by the game room. Non-smoking rooms are available. Pets are allowed for an additional fee. Parking is free. 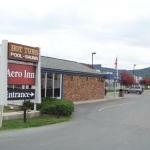 The Aero Inn is on Route 93 a three-minute walk from Lion Park. Drive one-and-a-half hours to visit Glacier National Park or go 23 miles to the Whitefish Resort Ski Area. It's 10.2 miles to Glacier Park International Airport.